A perfect storm of demand, supply and economic factors are making Florida an excellent place to buy real estate. 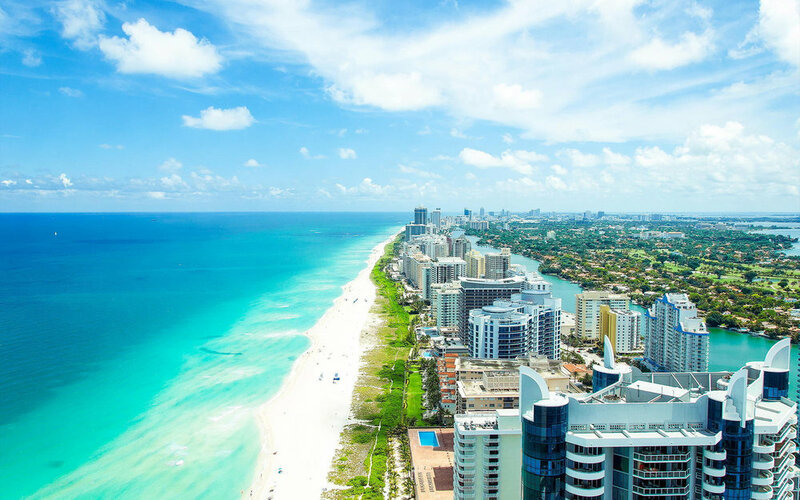 Miami is the kind of place that when the economy works well, it flourishes immensely and prices there are the first to rise, however, when there are financial hardships and uncertainty in the market, it is the first place to get hit - and last year we have felt that ourselves. Florida is attracting many new residents, including foreign buyers, due to its strong economic performance in 2017. South Florida’s population hit 6 million for the first time, which generated strong demand for housing and rental units in South Florida market. The summer 2018 forecast for Miami and most of South Florida is very good. The summer outlook is bolstered by a strong US economy, growing tourism, and strong employment. The median time to contract for condos was 76 days, an 8.4 percent decrease from 83 days last year. The median number of days between listing date and closing date decreased 7.3 percent to 115 days. The trend nationwide of course is to rising house prices due to constrained availability. The latest US housing report shows consistent strength in all major housing markets. San Francisco, the Bay Area and New York have lead the way with strong rises. Miami, Florida placed 9th in prices in the US, according to a report from Zillow. The Miami housing market for 2018 and 2019 buyer profile are very similar to what you’ll see in the Boca Raton South Florida real estate market forecast. Recent events have affected foreign interest. The biggest event here to affect buyers, and therefore prices, is Hurricane Irma, and several other hurricanes that passed through. If we’ve seen the worst of the impact, then housing is likely in for a good period from 2018 to 2019. The Federal Reserve recently raised key short-term interest rates and maintained the current forecast for three hikes this year. The rising rates not only signals a strengthening economy, but it also has specific meaning for the real estate market. The U.S. central banking system foresees the economy growing faster than they projected in December with a growth of 2.7% this year, up from the previous forecast of 2.5%. This is positive news for the real estate industry, particularly for investors. Additionally, the federal tax reform, which was signed into law on December 22, 2017, set a deductions cap for income, sales and property taxes at $10,000. The new cap is leading more residents of states with high property values and state income tax to purchase properties in states such as Florida, which has no state-income-tax and a pro-business tax structure. The Miami luxury condo and home market are experiencing a period of demand, according to the Miami Association of REALTORS® and the Multiple Listings Service (MLS) system. Miami existing condo sales rose for the fourth consecutive month in February of this year while luxury condos priced at one million and up saw an increase in sales of 31% from 116 in February of 2017 to 152 a year later. Luxury home sales alone increased 31.1% from 61 to 80 homes sold. The sale of homes fell at the national and state levels, but in Florida, the sale of condos rose 5.9 percent compared to January 2017. The local real estate market is in good shape, according to a report by the Miami Association of Realtors. January saw an increase in the sale of condominiums, single family homes and luxury properties valued at $1 million or more. Overall, Miami properties sold for fairly close to the asking price and the marginal amount of new condominium developments being built in the past two years have caused inventory to be absorbed, allowing prices to continue stabilizing, which sends a buy signal to the market. There were very few new construction starts in 2016 and 2017, and almost none projected for 2018. Experts agree that the future pipeline for luxury projects in South Florida is almost non-existent right now, and that lack of new supply is going to hit everyone. For buyers who do want new, they need to act now and purchase in a project that’s either recently closed or is scheduled to close soon. Otherwise, it will be 2021 or 2022 before anything else hits the market, making the condominiums that are under construction now extremely valuable. We are quite confident that the Miami real estate market will continue to grow ever stronger, and we have no reason to believe it will slow down in the near future - especially for water-front luxury developments due to significant land scarcity.